Sam, Dean, Scooby and Shaggy in 'Scoobynatural.' 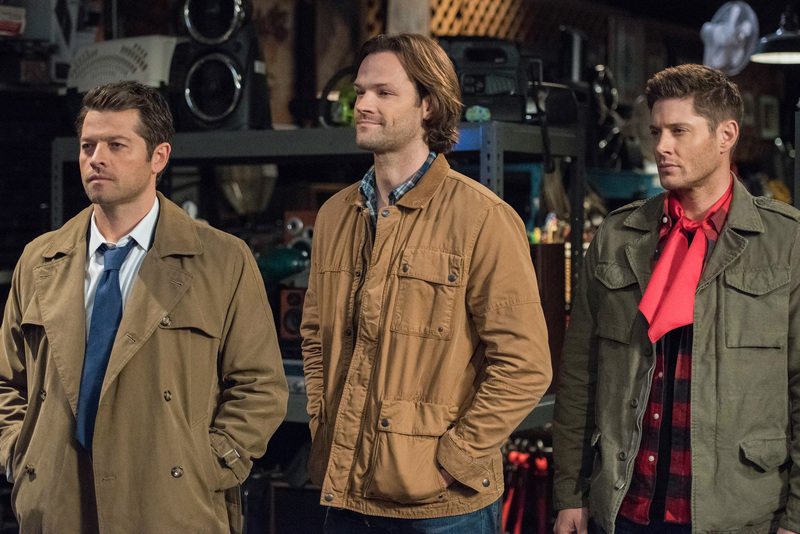 (The CW/Warner Bros. Entertainment Inc.
Supernatural dropped lead characters Sam and Dean into an episode of Scooby-Doo on Thursday night, combining two of television's most popular ghost-hunting series. During their 280th episode, Sam (Jared Padalecki) and Dean (Jensen Ackles), get sucked into an episode of Scooby-Doo after defeating Pawn shop owner's possessed dinosaur costume. When they're rewarded with a new TV, they're suddenly sucked into the screen and plopped into a classic Scooby-Doo episode — Malt Shop, Mystery Machine and all. The special episode was an absolute delight and brought out the best parts of both the Supernatural trio and the Scooby gang. Here are some of the best moments and lines from Scoobynatural. Sam:"We're not just in any cartoon. We're in Scooby-Doo!" Dean: "That's the freaking Scooby gang!" No matter where their dad dragged the mon the road, Dean says, there was always a TV, and Scooby-Doo was always on. 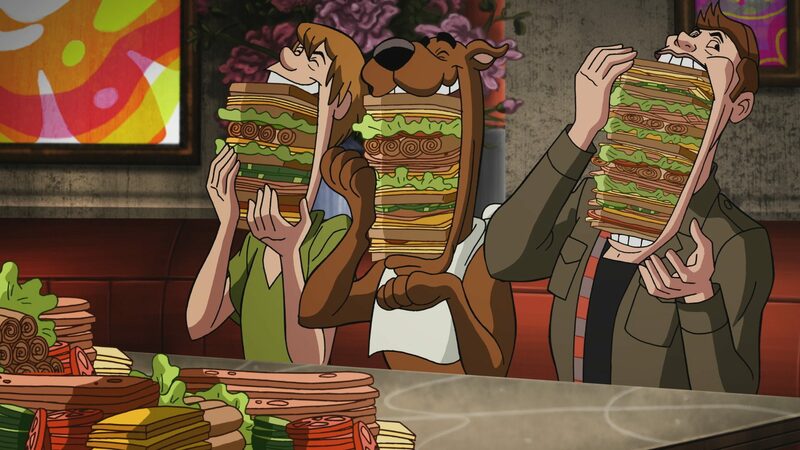 Later on in the Malt Shop, Dean partakes in his favorite pastime by wolfing down a huge sandwich alongside Shaggy and Scooby. The CW/Warner Bros. Entertainment Inc. The irony of hearing iconic Scooby-Doo lines in a Supernatural episode. Fred: "Sounds like this could be the start of a mystery!" Velma: "There's no such thing as ghosts." Fred: "Let's search the house for clues!" The Bad Man from the pawn shop: "I would've gotten away with it, if it weren't for you meddling kids." Dean challenges Fred to a race with him in the Impala and Fred in the Mystery Machine. It was a race for the ages between two iconic TV cars, but the Mystery Machine didn't even let Dean rev the Impala's engine. The episode was an actual Scooby-Doo, Where Are You! Episode from the show's first season in 1970. The mystery-solving, talking dog inherited a fortune from a mysterious Southern colonel whom he had previously saved from drowning. But to get the money, Scooby and the colonel's family members have to spend a night in his creepy old mansion. 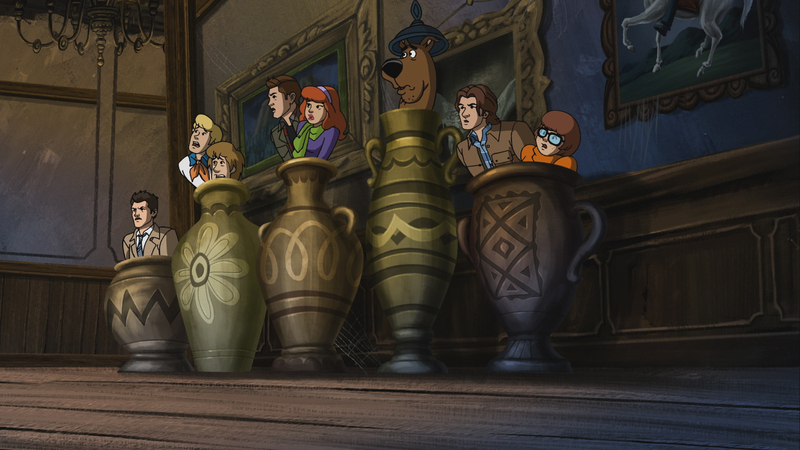 Castiel shows up animated, too, and gets paired with Scooby and Shaggy as the groups search for clues on the scary (real) phantom that's haunting the mansion. Sam, Dean and the Scooby gang realize that the phantom is real, and not just some "unscrupulous real-estate developer" in a mask. Unlike in the original Scooby-Doo show, Scoobynatural has animated death and dismemberment and Shaggy even breaks and arm, prompting the Scooby gang to have an existential crisis. The iconic Scooby-Doo theme song plays while the two groups run around the mansion trying to escape the ghost. But in the end, Sam and Dean equip the Scooby gang with ghost-hunting essentials like salt, iron, weapons and holy water. Once they trap the spirit in a salt circle, it reveals itself to be a tormented young child who has been used by "The Bad Man" from the Pawn shop. He forces the spirit to torment property owners so they'll sell their buildings for a lower price. To help keep the young boy spirit safe, Sam and Dean go back on their word and tell the Scooby gang they were wrong — ghosts aren't real. This line from Velma prompts a fourth wall-breaking side-eye from Castiel. Before Sam, Dean and Castiel return to their three-dimensional forms, Velma — who's been crushing hard on Sam and his muscular shoulders the whole episode — kisses him. Dean dons a new fashion accessory to complement his flannel shirts, jeans and a leather jacket — a shiny red ascot.